Welcome everyone! I have TWO cards to share with you today. 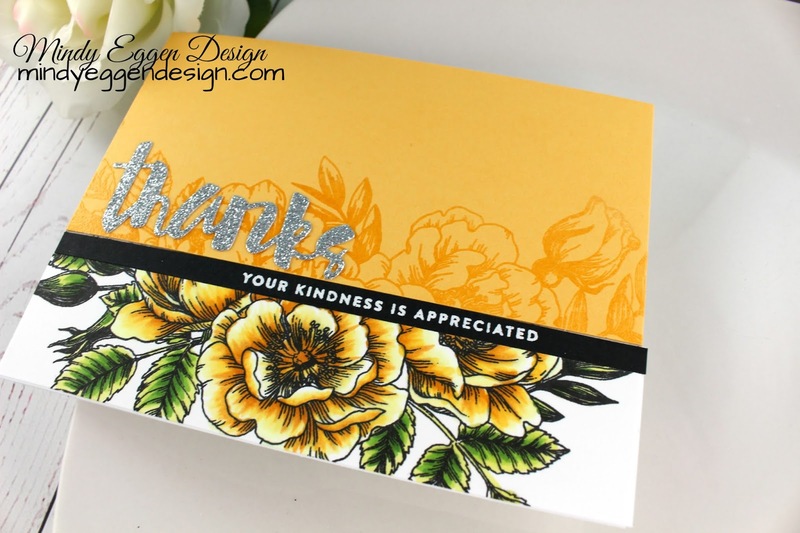 I’m using this gorgeous stamp set from Simon Says Stamp called Beautiful Flowers by doing some split coloring/stamping. Be sure to keep reading to view my video I’ve included. 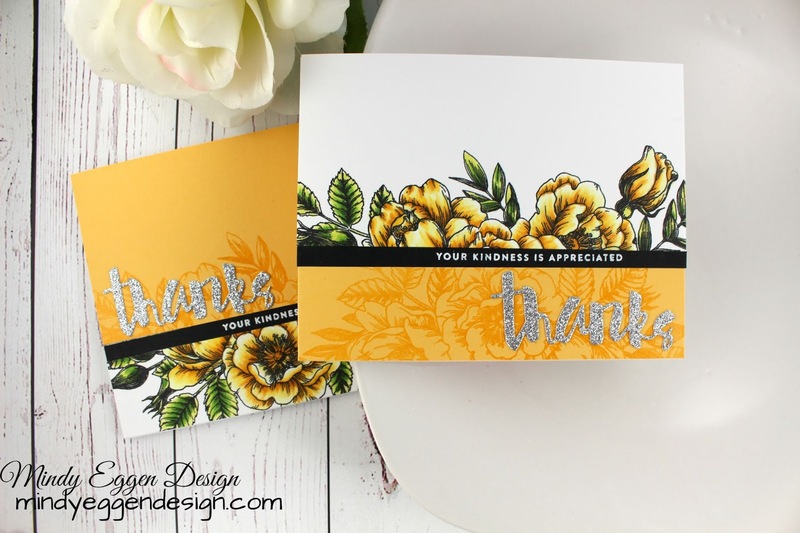 This stamp set was part of the June 2018 card kit of the month. 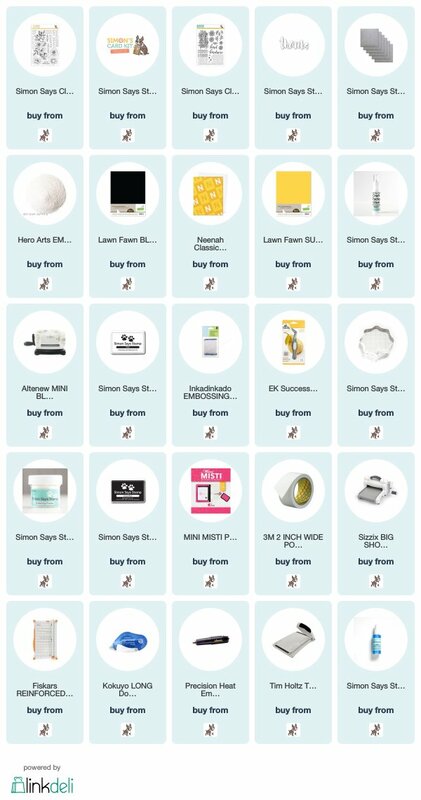 Unfortunately this kit is sold out but you can sign up for the next kit so you don’t miss out. You can also purchase this stamp separately as well which I’ll provide links to down below. 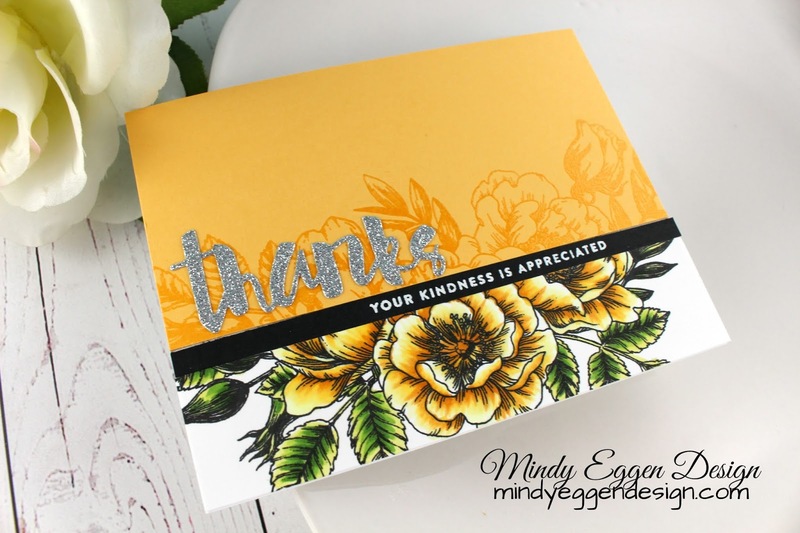 Using my Misti tool, I’m going to stamp my floral image on the bottom half of a piece of white cardstock. 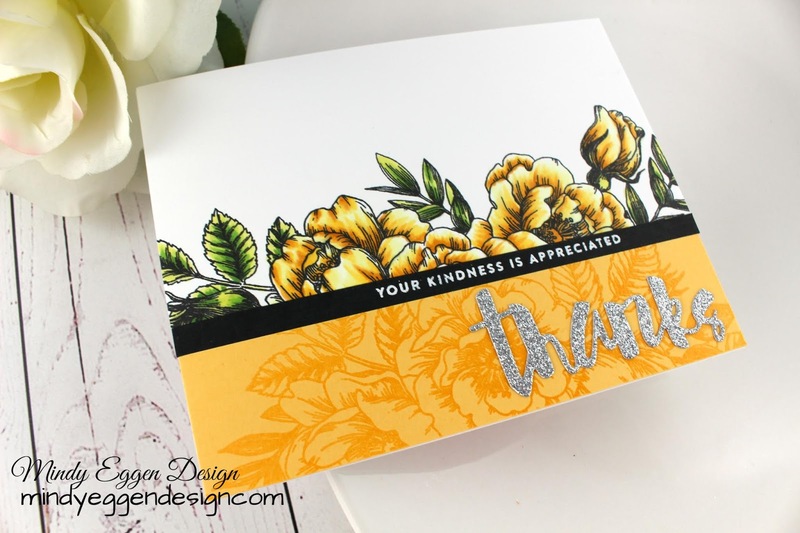 I’m using Neenah Solar white 80lb cardstock measured at 4 1/4″ x 5 1/2 and I’m stamping in Simon Says Stamp Black Ink which is copic safe. 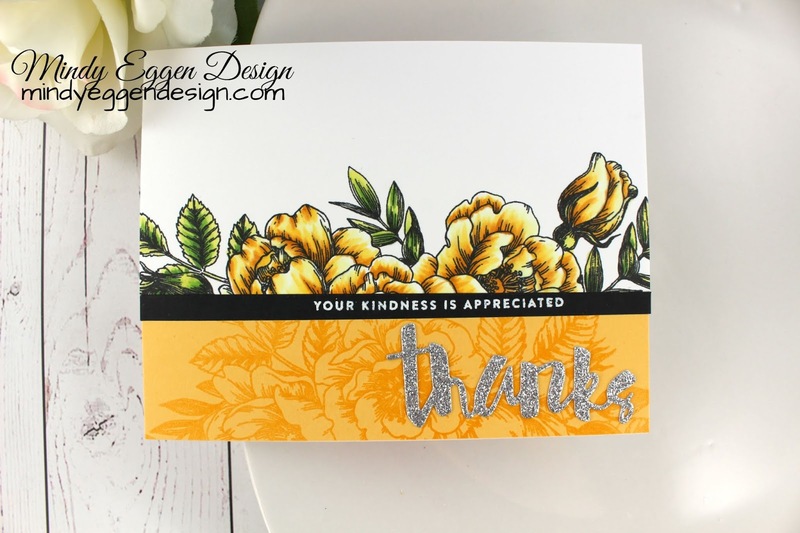 I’ll clean off my stamp, line up a piece of Sunflower cardstock in the same spot and stamp the floral image again except in Simon Says Stamp Clear Ink. Then heat emboss with clear embossing powder. 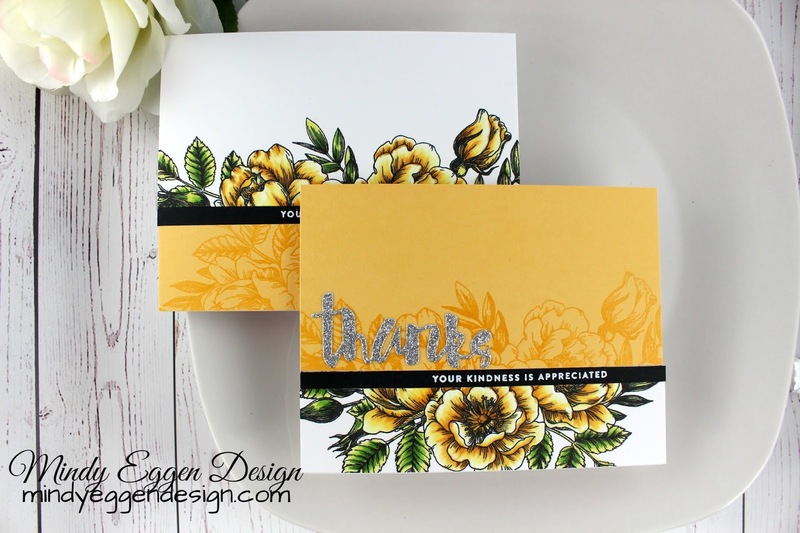 Keeping the cardstock in the same spot will ensure the floral image is stamped exactly the same on each piece. Next, I’ll color in my floral image using my copic markers. I’m following along the artist drawn lines for most of my coloring. I’m going to trim both pieces of cardstock down to give me 3″ top panel. 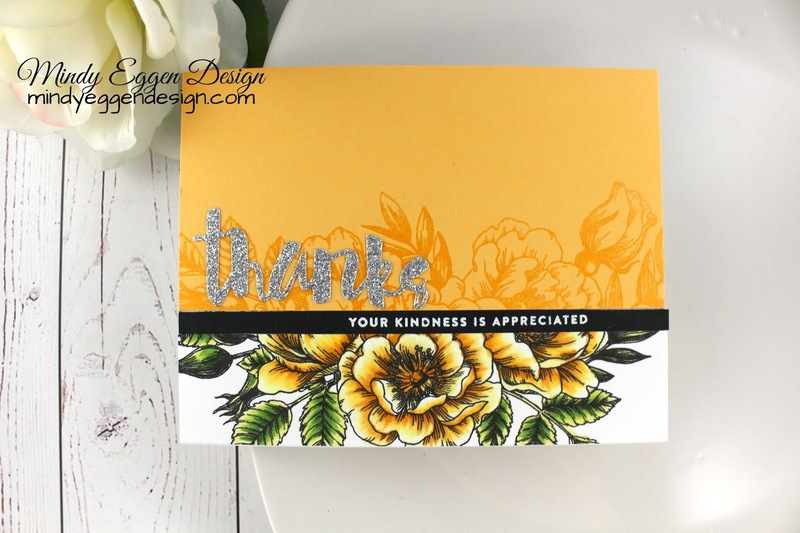 Next, I’ll stamp a sentiment from the Kind Flowers stamp set onto black cardstock and heat emboss with white embossing powder. Then I can trim this down to about 1/4″ strip. To assemble the card, I’m going to use an A2 size notecard for both. I’ll start by adding my bottom panel to the bottom of the card first. Then my black sentiment strip. I’m not worried about overhang because I can trim those off later. Now I can add my top panel to each card. I’ll use my Tonic trimmer to trim off the excess cardstock. 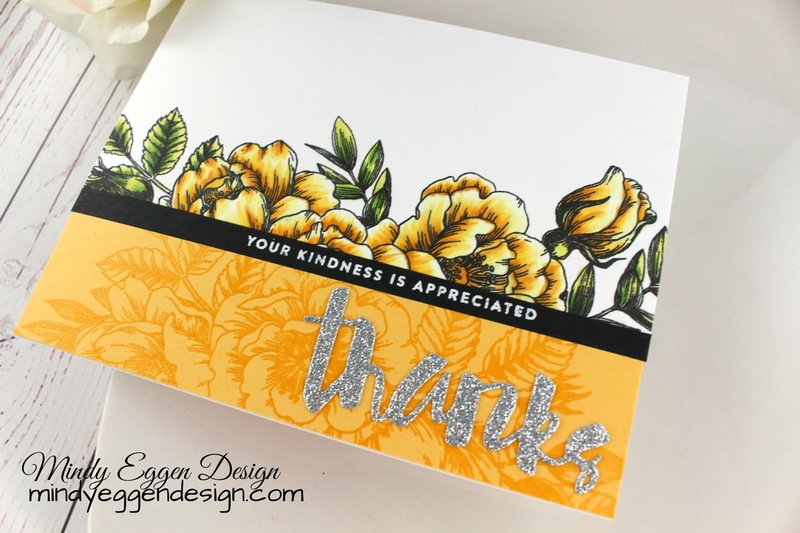 I finished off both card by adding the Painted Thanks die cut from Silver Glitter cardstock using Simon Says Stamp Tacky Glue. Regardless of my oops – I love how both cards turned out. I hope you’ll give this a try and learn from my mistakes. I also have a video you can follow along with. You can view it down below or HERE on my Youtube channel. I saw your cards on Instagram and thought how stunning they were and so clever too.